Large 5+ bedroom home in Frisco, Summit County – home of Colorado’s summer and winter playground. Frisco is centrally located to 4 world-class ski and summer resorts. Our home is in a quiet residential neighborhood within walking distance to Main Street restaurants/shops and to Lake Dillon. Frisco was recently named the # 2 in the "The "neatest/coolest" places to live in the US." It noted the location near the ski areas, the access to Lake Dillon and in the middle of beautiful Rockies. 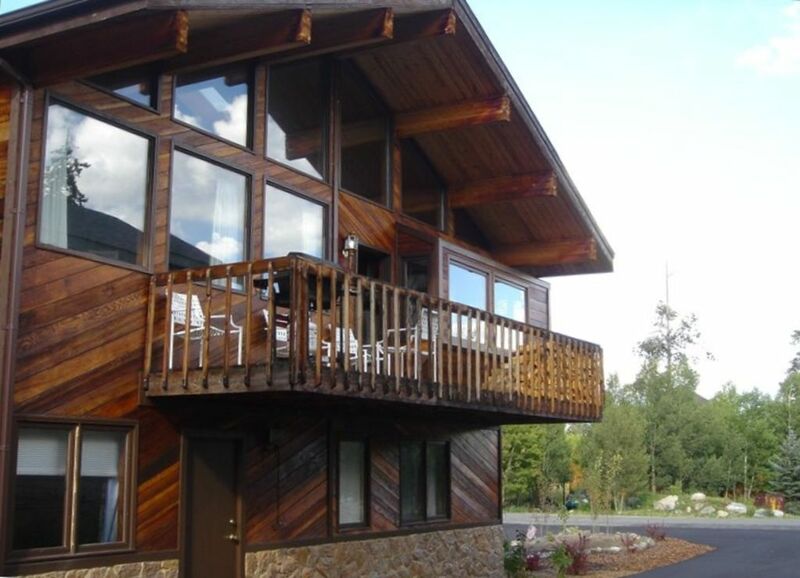 Large 5+ Bedroom Executive Home plus loft overlooking a large Great Room with a wood-burning stone fireplace provides mountain elegance for your stay. The home has 3 Master Bedrooms with en-suite full bathrooms-- each with jetted tubs for ultimate relaxation. The bathrooms have marble or granite vanity tops with double sinks. Two of the Master Bedrooms have King Beds and the third Master has a queen bed – all with top-of-the-line mattresses; Two Master Bedrooms have 40-inch HDTVs and the third Master Bedroom has a 32-inch HDTV. There is a fourth bedroom with a double bed with hallway access to full bath. The fifth bedroom has bunk beds-- a double bed on the bottom and a single bed on the top. Additionally there is a trundle bed if needed in this bedroom. A loft overlooking the Great Room has twin beds and acts as a sixth bedroom -- great for kids 8+ and young adults. There are 9 beds, so it is especially accommodating for large groups. Sleeps up to 14. This is not a rental condo but a private, professionally decorated, completely renovated home with premier furniture, top-of-the-line bedding, marble and granite counter tops, new 60 inch HDTV, etc. It has a fully equipped gourmet kitchen with a large beautiful granite counter top -- bar stools and a game table provide additional seating. Kitchen area opens to the Great Room where an expandable game table is available for family games. Knotty Pine doors throughout. Home has a top-of-the-line 8-person Artic Spa Hot Tub with 4 Captain Chairs, mood lights, waterfall, lots of jets with state-of-the-art Arctic Ozone, the finest purification systems available for hot tubs. If it is too cold for you to hit the hot tub outside, there are 3 jetted tubs in 3 of the master bedrooms to sooth those sore muscles after a day of skiing. The home has a 60 inch Sharp LED HDTV with Premium Movie Channels, Digital Video Recorder, and Blu-Ray DVD/CD player for your entertainment. High-speed wireless Internet is provided. The 60 inch LED TV is internet capable for streaming your favorite movies from Netflix in high definition. The home has a Bose music system which can play your iPhone, iPod or Android Phone music. Located in Summit County's city of Frisco in a quiet residential neighborhood -- close to Historic Frisco Main Street shops, restaurants, etc., and in the center of four world-class Summit County Ski and Summer Resorts: Keystone, Breckenridge, Copper Mountain, and Arapahoe Basin. Frisco is located on the west bank of Lake Dillon which is within walking distance. Also close to new Whole Foods, new restaurants, and the Frisco Transit Station that provides free bus service to all four ski areas. The home is only a few miles from the Outlet Malls and just 25-30 minutes to Vail and Beavercreek for a day of skiing or shopping excursion. As an additional amenity, six adult mountain bikes and 2 children's bikes are made available for guest use on the miles of paved bike trails in Summit County --a savings of $240+/day. The Executive Chateau is on the Frisco Bike Pathway. Retired (Colonel, US Air Force; US Air Force Academy alumni) still working in 'Corporate America' -- wife is retired Accountant ... patiently waiting for me to retire 'soon'... In the meantime, this allows us to let others enjoy our homes in Colorado's summer and winter playground (Frisco, CO) and in Phoenix throughout the year. Premier lodging for large groups and reunions; Frisco is quaint town centrally located close to 4 World-Class Ski and Summer Resorts and only 23 miles to Vail, Lake Dillon and Ten Mile Creek within walking distance, Shopping Outlets, etc. 8-person Hot Tub; 3 jetted tubs in bathrooms, Offer 8 mountain bikes for our guests. Frisco was recently named # 2 on "The "neatest/coolest" places to live in the US" by a national magazine survey. Enjoy the eight-person Hot Tub or relax in your own (one of three) private bathroom with Kohler jetted tubs. This is not a rental condo with average furniture and bedding. Top-of-the-line mattresses, 4 large HDTVs, Bose music, granite and marble vanities, etc., will enhance your resort experience in Colorado. Three of the bathrooms have high-end jetted tubs and showers with granite or marble sinks. Frisco has the ambiance of a small western city with great restaurants and shops on main street. Large Great Room with Lots of sky lights and lots of windows with southern exposure. Large, custom granite countertop with bar stools for additional seating. Numerous board games for all ages. Free Netflix and internet TV for unlimited movies plus STARZ Premium Channels. 7 mountain bikes for our guests' use. (Two) New 300 SQ ft Deck with 8-person hot tub on north side. New deck off the kitchen on south side. Good central location between a variety of ski areas. Felix was readily available for questions over the phone and the house was fully stocked with mostly everything needed for a long stay. Enjoy. First Class from beginning to end. Felix and John were exceptional hosts. They made the difference! Standouts are the Hot Tub, Kitchen, and Appliances. The Greatroom with fireplace, two couches and rocker is perfect for lounging after a soak in the hot tub along with a toddy or two. The bedrooms and baths are well equipped and lots of hot water. Felix checks to make sure everything is perfect while John unobtrusively responds to the rare issue. We would use this property again,owner was on top of several small issue had every possible utensil needed..
Our stay at he Executive Chateau was amazing, with all the comforts of home! This home was more than adequate for our 11 family members! It is the best equipped place we have stayed for skiing. The hot tub is clean and convenient right on the side deck, there are terrific laundry facilities, the kitchen has everything you could possibly need, and two of the three bathrooms have been beautifully renovated. The owner is responsive and easy to work with, and we couldn't have asked for a better experience. There are more terrific amenities in this home than I could mention in a review, but all are top-notch. We will definitely be staying here again! We had a wonderful stay with our family at the Executive Chateau! The 2 master suites and bedrooms provided a feeling a privacy even while sharing a living space. The living room/kitchen area was perfect for preparing and sharing meals with a group of adults and kids. It provided the perfect cozy setting for playing games, watching movies, or reading. The loft and bunk room were fun places for kids to sleep and play. Felix provided good clear instructions, and we felt very well provided for. This was a wonderful launching pad for all of our adventures in Summit County and also just for spending quality time together. Thank you! Very nice, spacious house. Kitchen is well stocked and the bathrooms are updated nice. Frisco is a nice central location to all of the local slopes.